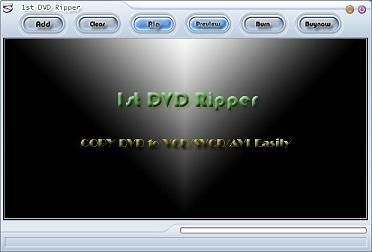 1st DVD ripper is a DVD Ripper and copying software which copys DVD to VCD/SVCD/DIVX/MP4/iPod files. 1st DVD Ripper is an ideal method to dup dvd or make backup DVD copy. In 1st DVD Ripper, Powerful wizard will help you to complete conversion setting in several steps. It also provides you a powerful skin builder, you can then build your own DVD Ripper. You can also choose to convert a specific segment of DVD movie by specifying time frame or chapter if you do not need to convert the whole movie. More attractions include bitrate options, user-friendly interface, and excellent resulting quality. New version is optimized for Pentium 4 CPU and supports VCD/SVCD burning.